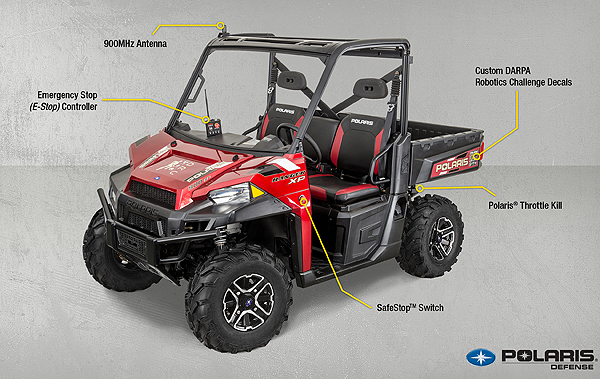 Polaris Industries Inc. is the leading manufacturer of off-road vehicles. Their Ranger XP 900 EPS vehicle was used exclusively during the DARPA Robotics Challenge that was held in December 2013 at the Homestead-Miami Speedway in Florida. 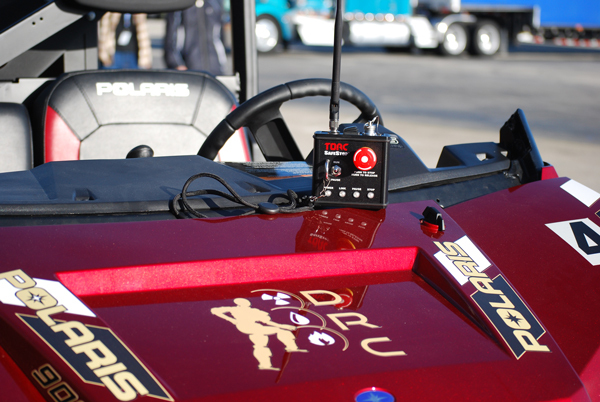 For dependable safety, Polaris decided to equip each Ranger used during the competition with a TORC SafeStop™ Wireless Emergency Stop System. The DARPA Robotics Challenge is a competition of robot systems and software teams that set out to develop robots capable of assisting humans in responding to natural and man-made disasters. The competing teams tasked with completing eight specific tasks that stimulated the duties a robot might have to perform in such a dangerous situation. One of the tasks was to demonstrate the robot’s ability to operate a vehicle. DARPA chose to use the RANGER XP 900 EPS vehicles, which were all customized for the challenge with a TORC SafeStop Emergency System. For this task, the robots will drive the vehicle through a 250ft course with obstacles and varied widths, and demonstrate the capability to turn the vehicle in a full circle. With each vehicle being customized with a TORC SafeStop System, each team was able to stop the vehicle from moving at any given moment, if needed. The Polaris vehicles weren’t the only ones to include one of TORC’s products. NASA created its own robot for the DARPA Robotics Challenge; the Valkyrie, a 6 foot-2-inch humanoid machine with detachable arms, sonar sensors, mounted cameras, and a glowing circle in the middle of its chest. Unlike DARPA’s own Atlas robot, (like Team ViGIR used in the competition) Valkyrie doesn’t require a tether, running instead on a 2kWh battery stored on the machine’s back. Because they did not have an emergency stop through the tether like the other robots, they included one of TORC Robotics’ SafeStop systems on top on its battery component, on its back. With the SafeStop they were able to turn off the robot and stop it from making a wrong move as a safety precaution, if needed. TORC provides solutions for drive-by-wire conversion, emergency stop, power management, autonomous navigation, and operator control. The ByWire XGV, a drive-by-wire Hybrid Escape with integrated SafeStop safety and PowerHub distribution systems, provides an integration-ready base platform for autonomous system development. Polaris designs, engineers, manufactures and markets innovative, high quality off-road vehicles, including all-terrain vehicles (ATVs) and the Polaris RANGER® and RZR® side-by-side vehicles, snowmobiles, motorcycles and onroad electric/hybrid powered vehicles. Polaris is among the global sales leaders for both snowmobiles and off-road vehicles and has established a presence in the heavyweight cruiser and touring motorcycle market with the Victory and Indian motorcycle brands.